Our expert team provides quality, compassionate and accessible heart and vascular care to patients in southern Colorado, New Mexico and Arizona. Renowned for advanced care, we manage everything from general cardiology needs to providing the region’s leading care in several subspecialty areas. No matter what type of care you need, you will benefit from our personalized, multidisciplinary approach to treatment. We have outreach clinic locations in Baca, Fremont, Huerfano, Kiowa, and Prowers counties. Please call 719.365.7172 for more information. Want to know your heart disease risk? Take the online heart risk assessment today. The cardiothoracic specialists at UCHealth deliver world-class care to patients who need highly skilled, cutting-edge surgical treatment. Expert surgeons team with well-trained cardiac professionals to care for you before, during and after surgery. Our surgical experience also allows us to provide patients with a full spectrum of care for elective and emergency procedures. Our surgical specialties include aortic and aortic root surgery, minimally invasive cardiac surgery, valve preservation and more. A comprehensive program managing cardiac arrhythmias with treatment options ranging from medication to atrial and ventricular ablation to pacemaker and defibrillator implantation (ICD) and the WATCHMAN™ device. When you are in advanced heart failure, you want the best care fast. The UCHealth team treats coronary artery disease, peripheral artery disease, STEMI (myocardial), heart attack, chest pain and acute coronary disease. We offer interventional treatment (stents), medical management, angioplasty and surgical intervention. Our response and treatment of a heart attack is significantly faster than national guidelines suggest—we get you in and into lifesaving care faster. The largest volumes in the region for advanced interventional valve treatments for valvular heart disease, with outcomes better than the national averages. Therapies include transcatheter aortic valve replacement (TAVR), WATCHMAN™, PFO/AS and MitraClip mitral valve repair. At UCHealth, our team of general, trauma, vascular and critical care surgeons provide expert evaluation and surgical treatment for a wide range of adult vascular conditions, including carotid artery disease, peripheral vascular disease, pulmonary embolism, renal vascular disease and more. After a heart event—such as a heart attack, heart surgery or angioplasty—you need to rebuild the strength of that muscle and improve your cardiovascular health. At UCHealth, our rehabilitation program is in three phases: inpatient, outpatient and maintenance. The third phase is open to the public and allows you to work out with others who are going through rehab. Heart Failure University is a free education series designed to provide valuable information to people who are impacted by congestive heart failure. Join us the second Tuesday of each month from 2 to 4 p.m. No reservations required. Patients are welcome to bring family members, friends or caregivers. For more information, call 719.635.3039. If you’re on anticoagulants and currently seeing a UCHealth provider, this clinic can help you manage your medications. Visit UCHealth Memorial Hospital Central Mondays through Fridays, 7:30 a.m. to 4 p.m., or UCHealth Memorial Hospital North on Tuesdays and Thursdays from 8 a.m. to 4 p.m.
To allow enough time to complete your check-in process, please arrive 30 minutes before your scheduled appointment. We require 24 hour advance notice if you cannot make it to your scheduled appointment. If you have young children who will be accompanying you to your appointment, please try to bring another adult with you to sit with the children during your time. Our office participates with many different insurance companies. Because insurance plans, policies and laws often change, please contact your insurance company to see if we are a contracted provider. Find information about insurance and billing. For information or questions about your bill, please visit UCHealth online bill pay. The American College of Cardiology has recognized UCHealth Memorial Hospital Central for its demonstrated commitment to comprehensive, high-quality culture and cardiovascular care. 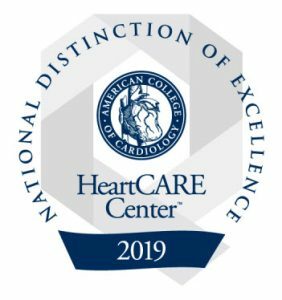 Hospitals receiving the HeartCARE Center designation from the ACC have demonstrated their commitment to consistent, high-quality cardiovascular care through comprehensive process improvement, disease and procedure-specific accreditation, professional excellence, and community engagement. Memorial Hospital Central is the first hospital in Colorado to earn this designation. Our cardiology team is nationally recognized and committed to providing the highest-quality care in the region. 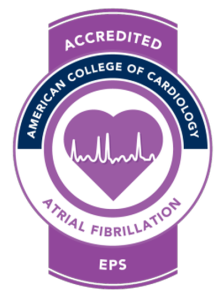 Our Atrial Fibrillation program is accredited by the American College of Cardiology—we evaluate and manage patients with A-fib more precisely, improve patient outcomes and educate patients and healthcare providers, leading to more effective and efficient disease control. The American College of Cardiology has recognized UCHealth Memorial Hospital for its demonstrated expertise and commitment in treating patients with chest pain. UCHealth Memorial Hospital was awarded Chest Pain Center Accreditation with Primary PCI and Resuscitation based on a rigorous on-site evaluation of the staff’s ability to evaluate, diagnose and treat patients who may be experiencing a heart attack. 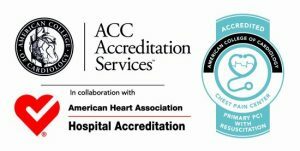 Hospitals that have earned ACC Chest Pain Center with Primary PCI and Resuscitation Accreditation have proven exceptional competency in treating patients with heart attack symptoms and have primary PCI available 24/7 every day of the year. The American Heart Association has recognized UCHealth Memorial Hospital Central for its continued success in using the Get With the Guidelines – Heart Failure program and applying the most up-to-date, evidence-based treatment guidelines to improve patient care and outcomes. At UCHealth, we conduct a wide range of cardiac research studies into conditions such as coronary artery disease, atrial fibrillation, congestive heart failure and more. Our patients have access to innovative therapies that aren’t already widely available, and they have more frequent evaluations in addition to their traditional appointments. Eligible patients have several options for participation in a safe, well-monitored environment. For information or questions about cardiac research at Memorial Hospital, please call 719.365.3072. UCHealth offers an extensive heart and vascular care library, including information on tests and procedures, conditions and diseases.